Some of my finest swearing takes place while driving, or rather crawling, along the 880 - a congested, polluted, almost-always-jammed monstrosity of a freeway that slithers past Tesla’s car-making plant in Fremont, California. Each time I’m unfortunate enough to find myself on this stretch, I’m struck by the symbolism: a road thick with fumes, overlooked by a factory working overtime to change that. From that vantage point it’s pretty hard not to root for Elon Musk’s company, or at the very least his vision for a cleaner, more sustainable energy industry. So far, he’s making incredible progress. “Can you name any other car company, in the history of mankind, that has gotten to where Tesla has in 10 years?” asks Bob, a Tesla fan I meet after he pulled into the factory to charge his beloved car. I can’t, of course. Tesla's rise has been astronomical, bordering on absurd. Earlier this month, Tesla (albeit briefly) became the most valuable car company in the US, overtaking both Ford and General Motors. Two companies that, as well as being around for decades before Mr Musk was even born, sell vastly more cars than Tesla - and make far more money doing it. But that doesn't matter to investors, who have been falling over themselves to buy up Tesla’s stock, pushing it to a valuation of around $50bn - more than double what it should be, according to some. “The market’s giving them credit now for something they may or may not become,” said Brian Johnson, an automotive analyst at investment bank Barclays Capital. Tesla Motors wasn’t founded by Elon Musk, but it for sure wouldn’t have survived without him. He doesn’t do many interviews, and declined to speak to me for this article. But that’s OK - because much like this country’s current president, Mr Musk does much of his thinking aloud, on Twitter. He uses it to speak directly to his fans, bypassing the necessity of using the press to get his message out. Often, I’m told, without warning his long-suffering communications team in advance. “Stormy weather in Shortville…” was one such tweet sent, gleefully, on 4 April as Tesla’s stock was riding high. He was having a risky dig at all those investors who sold off Tesla stock at the high price on the assumption they could buy it back again when the price dropped - skimming off the profit. It’s a tweet that might come back to bite him, predicted Mr Johnson, who draws parallels with that iconic scene in the Matrix, where lead character Neo is given a choice of a red pill - and discover reality - or a blue pill, meaning blissful ignorance of the truth. “Investors are very happy to take the blue pill right now,” Mr Johnson said. “Especially when the stock has been going up like it has. 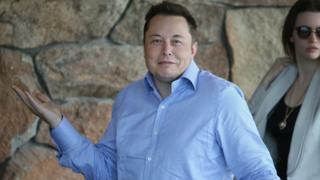 He believes blue-pillers see Tesla’s headstart in battery manufacture, autonomy and other energy-related side projects as giving the company an unbeatable, perhaps even monopolistic advantage. But it’s far from certain. "Tesla may be one of the finalists,” Mr Johnson said. "But not the only one. You’re not talking about an industry structure that becomes iPhone-like. Just over a year ago, I stood and watched as Mr Musk took to a stage in Los Angeles and unveiled the Model 3, his most important product yet. His loyal fans whooped and hollered. Unlike the cars that came before it, the Model 3 was meant for people with slightly more modest incomes - $35,000, minus the incentives offered to people buying green vehicles. That night, he invited pre-orders - and he got them by the hundreds of thousands. Problem is, he doesn’t yet have a factory capable of building them quickly enough. Last year Tesla made 80,000 cars. General Motors made 10 million. Mr Musk has invested massively in streamlining and innovating the Tesla production line in Fremont, but it’s a huge task. “We have to see the proof that they can make the car, that it comes in at the price they promised, and that they can make a lot of them,” said Ashlee Vance, a Silicon Valley-based journalist and author of Elon Musk: Tesla, SpaceX, and the Quest for a Fantastic Future. “Tesla has not done a good job of making lots of cars,” he added. Mr Musk is used to people telling him his ambitions are too great, or that his promises are recklessly optimistic. But over the years, since his fortune-making days as co-founder of PayPal, Mr Musk has developed an incredible ability to deflect missed targets with even bigger ones. As investors wait on Tesla to deliver on those Model 3s, for example, Mr Musk is busy tweeting about his planned September unveiling of a electric powered articulated lorry. And a pick-up truck. His Gigafactory - the largest factory floor in the world - is just getting operational, and already he is talking about building two or three more. Or perhaps even 100. What Mr Musk has created is a sense of excitement that has followers locked in admiration, and investors gripped by FOMO - the Fear Of Missing Out. What if Tesla becomes the next Apple, the next Amazon. What if it’s even bigger than that? Whatever your assessment of the valuation, there’s no questioning that the Cult of Elon is stronger than ever - and it adds billions to Tesla’s value. “This is almost all about the personality,” added Mr Vance. "If you put almost any other executive in charge of this company there’s no way it has the same glow around it.